Implicit in the opening of the Dispatch’s editorial is that the rights of the Mount Vernon middle school science teacher, John Freshwater, are a waste of taxpayer money. The Dispatch concluded that Freshwater is guilty of the allegations against him—and his attorney has not even started his defense. Although the Dispatch acknowledges that Freshwater is “entitled by state law” to the hearing that is now underway, the Dispatch dismisses that the outcome may be in Freshwater’s favor. The Dispatch uses information from the report done by H.R. On Call, Inc. as if it speaks with finality on the controversy. This is despite that Freshwater’s attorney has called the reliability of that report into question. However, the Mount Vernon News of January 7, 2009, stated that in the testimony the day before, by the owner of HR On Call, Thomas Herlevi, “There was no empirical evidence that high school teachers had to ‘reteach’ Freshwater students.” This is important because the HR On Call report contained “testimony” by a teacher alleging the need to re-teach students. The Dispatch editorial does not say where the testimony they allege came from—it may have been from the report by HR On Call. A teacher who has students with the highest scores is not someone with a disregard for the subject that he teaches. Freshwater is not the only teacher to have used the electrostatic device in question on students and to have considered it safe. Back in August 4th 2008 one of his fellow teachers, Lori Miller, spoke before the school board and said that she has used the device in the same manner that Freshwater has without incident. “I have never had a concern or an issue with it and I cannot honesty comprehend how that device can burn an individual as alleged,” Miller said. The Dispatch editorial was not just a rush to judgment. It was a deliberate disregard of facts and context. What agenda does the editorial board of the Dispatch have? Is the Dispatch editorial about some real or perceived difference in beliefs between them and Freshwater? The Code of Ethics states that a journalist should “Examine their own cultural values and avoid imposing those values on others.” The Code of Ethics also states that a journalist should avoid stereotyping based on religion. Who is a “budding John Freshwater”? Is that someone who holds different beliefs than that of the Dispatch editorial board—but is still able to teach science well enough to be the “best” by state testing standards? What does the Dispatch mean by “sound education”? We already know that for the people who wrote the Dispatch editorial “sound education” does not necessarily include teaching that results in top scores on state tests. What, then, does “sound education” mean? Does it mean education taught by someone who never disagrees with the Dispatch’s editorial positions? 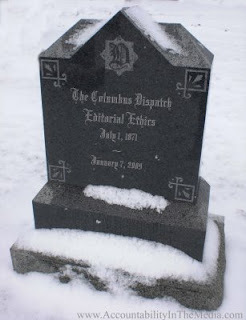 The Columbus Dispatch editorial “Teaching moment” was a disappointing example of journalism. The Dispatch should retract the editorial and issue John Freshwater a written apology for the journalistic misconduct that the Dispatch editorial board engaged in on January 7, 2009.